is one of the plants from Korea which is known throughout the world. Today many herbal manufacturers incorporate a number of elements in the content of ginseng products. 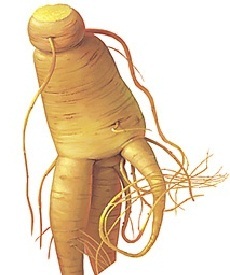 Of the health benefits of ginseng for these are much in demand by the public. Trend taking ginseng has been started since the first until the consumption of ginseng was continued through to the present, but among the world's various types of ginseng, Panax ginseng Korean ginseng is the best quality. No wonder then that Korea is said to be the best place to plant ginseng. It could be because Korea has four seasons, the temperature is right, good soil, and just get annual rainfall, making ginseng planted there to give good quality. For health benefits of any Panax ginseng is said more than the ginseng grown in the U.S., Japan, or China for Korean Ginseng contains saponins more. Saponin in ginseng refers ginsenosida, references to distinguish it from the usual saponins found in seasoning such as garlic and onions. Saponins can reach a maximum level in the sixth year after planting ginseng, but the quality will drop after the seventh year. Ginsenosida is what can help boost immunity, lower stress levels, and increase blood circulation. Many studies have shown that ginseng also helps fight cancer, improve heart function and slow the aging process. Benefits of taking ginseng in the form of tea is an effective way to supplement the diet with a potent herb. Ginseng tea can improve the health and performance of the body. The benefits of ginseng tea also helps reduce fatigue due to glycogen conserve and encourage the body to use fatty acids for energy. Only it is advisable to consult first before taking them.